Almost every online search starts at the same place: Google. Whether you're looking for the name of the actor from Game of Thrones, or the nearest gluten-free bakery near you, Google is the first place people normally go when they have a question and need an answer. When renters are searching for a new home, they start there. While a professionally designed website is imperative for effectively communicating and marketing online, it is also important to make a good first impression on the search engine results page. Using Google Reviews on the results page to promote your business and trustworthiness is a key factor in gaining a better page rank and increasing your website traffic. If you were to Google your business, you'd likely see the Google Places information, which can include user reviews that you might not have been aware of. These reviews aren't approved by you, and you cannot respond to them.This feature can greatly impact the first impression you're giving to online prospects. If your business information is incomplete or there are bad reviews, you're potentially losing prospects right from the search results page, before they even click on your website link - even if you show up in the number one spot! Getting good, quality reviews from real tenants and clients is important. Testimonials on your own website is great - however, people typically view these as coming from a biased perspective. Not many companies are willing to add negative testimonials on their own website, so how often is the user getting the 'full picture'? Google reviews are unbiased - as a business owner, you cannot remove a negative review unless it violates the standards Google has set in place. This has resulted in Google reviews being a more trusted source than what you're approving and entering on your own website. "An unhappy tenant left a bad review on Google and now it's the first review my prospects will see. How can I get rid of it?" 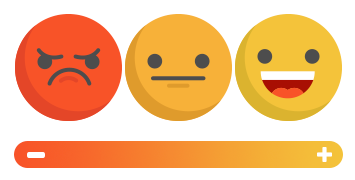 Negative reviews are unfortunately more common than positive ones, since people who have had good experiences tend to recommend your business or services by word of mouth, and likely offline. So, how do you combat the bad reviews? By asking for good ones. It will take some effort on the business owner's part, to encourage happy clients to add a Google review, but it will be worth it! 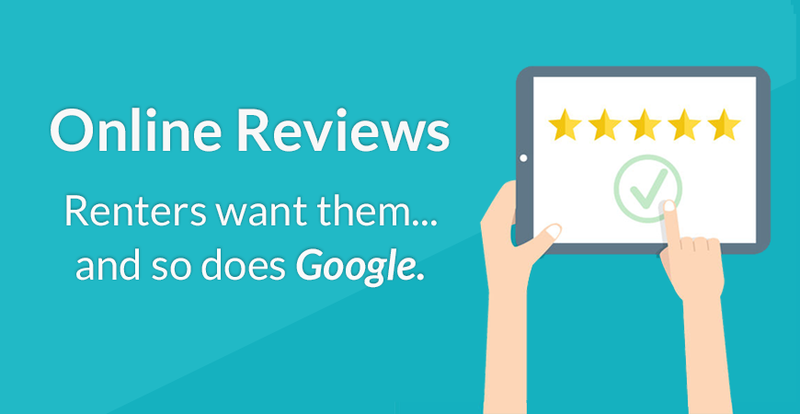 When you hear from a happy client, simply ask if they would be willing to share their feelings on a Google review. Or, send an email out to long-term clients who have supported you and ask if they would be willing to add a recommendation on a Google review. The more recent, positive reviews you have - the less likely a user will come across a negative one. Adding to and improving your Google reviews will help you rank better in the search results overall and will also help convey that you are a great and trustworthy company to interact with! 3) Put up signage reminding people to share their love if they love where they live! 4) There are also some technologies that help you reach your tenants and encourage them to post their reviews, especially if they are positive. For help selecting the best tool for you, please feel free to contact me directly.